Featured with a 15.6-inch XGA display with integrated Xpol 3D filter technology and 1366 x 768 resolutions, the LIFEBOOK AH572 3D notebook is also equipped with a 1.3-megapixel camera with the ability to record 3D video. It boasts with 4GB of DDR3 RAM and 500GB Serial ATA 5400 rpm hard drive, integrated with HD 3000 graphics, two USB 3.0 ports, supports HDMI connectivity, wireless 802.11 a/b/g/n and Bluetooth v2.1 enabled, and comes with a Lithium ion 6-cell battery that provides up to seven hours of battery life. 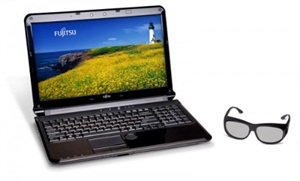 The Fujitsu LIFEBOOK AH572 3D notebook is available for the price of $999 at Fujitsu Store with a pair of circular polarized 3D glasses.